Motocross is a very fast-paced sport, where landing a jump incorrectly can lead to disastrous consequences. MXGP 3 scales back the risk a bit, in that crashes and running off-course are situations that are quickly remedied by a reset of your racer, in stark contrast to the harsh reality of the sport: crashes at speed can put competitors out of the race, and sometimes permanently. In fact, a simple press of the R1 button will engage a rewind mechanic, so that you can try that tight corner with a different approach and maybe not fall off a cliff in the process. However, this key game mechanic is never explained by the game, and is only indicated in the control screen. 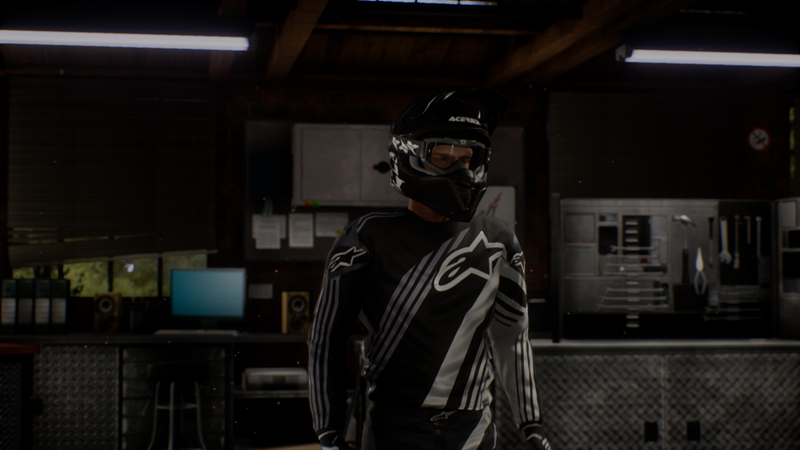 The Unreal Engine 4 was used to develop MXGP 3, and this results in a noticeable graphical bump to the game. It appears the game targets and hits a solid 30 frames-per-second, with no noticeable stuttering during races. Since this is a game geared towards simulation fans, there’s not much in the way of fantastic effects or other graphics enhancements. In fact, although the game has a weather system, whenever a track is loaded under rainy conditions, the “rain” appears to be nothing more than an animated overlay, which marginally reacts to the speed that the camera is currently traveling. There’s no indication that your bike is being hit by rain, and the track also appears static, with simple puddles accumulating at certain spots, and not really changing. 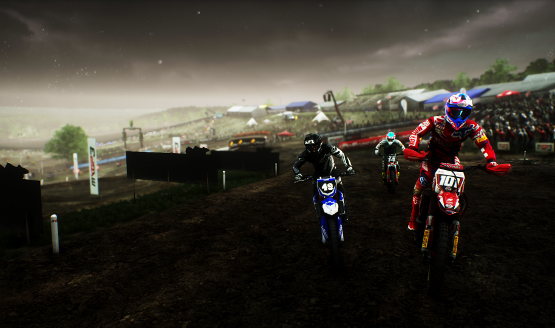 MXGP 3 has a few game modes, such as single races and a championship. The main draw is the career mode, where you start as an entry-level MX2 racer. As you begin winning races and, later, championships, sponsors will take notice. Eventually, you will have several sponsorship offers, and can move between contracts at certain times during the season. You have a generic-looking manager who sets goals for you, which can net you reputation if you are able to perform them, or cost you reputation if you fail. The campaign feels a bit uninspired, since the manager quickly repeats lines, only changing the name of a racer that you are tasked with beating, and alerting you of new sponsorship offers. A season of racing does take a good couple of hours to complete, at least, and real-world tracks are represented from all around the world. Audio work in MXGP 3 is rather minimal. There’s bike recordings, ambient track and crowd sounds, and a soundtrack. The soundtrack is one of the most generic of its kind that I have ever heard. It’s not corny or poorly-done, though, featuring some bass-heavy tracks and melodic downtempo beats on occasion. It’s just that there’s not a single inspiring track to be found here. Some racers like to get their blood pumping to head-bangers; others like to zone out to Zen-inducing meditation music – none of those options are here. This is likely due to Milestone not allotting much of its development budget to the game’s soundtrack. Whatever the case, MXGP 3’s soundtrack disappoints. Alright, so, maybe the presentation is ho-hum, the campaign is lacking, and the audio work is equally uninspiring. But what about the core of the game, the racing? I am happy to report that what matter most, why people would even entertain the thought of buying this game in the first place, the actual racing, is a treat. You don’t race a motocross bike the same way that you race anything else. You subtly shift your weight around, and move the bike in ways to maximize your aerodynamics. Close to two dozen contenders duke it out, defying death, cutting corners, and trying their best to break away from the pack. Milestone has kept controls simple. Gas and brake are on the shoulder triggers, turning is on the left stick, and shifting your weight is on the right. A 250cc bike feels worlds apart from a 450cc bike. With the ground actively deforming dynamically as it is driven over, you have to pay attention to what’s in front of you as well as what may be just ahead. Bikes remain very responsive to your touch, and for the most part any failures you encounter are due to your own fault. The way that Milestone appears to know their way around motorcycles is this game’s saving grace. This is as close to putting throttle to dirt as you can get without stepping out onto a track in real life. One thing that is included in MXGP 3 that is an absolute must in racing games these days is a photo mode. At any point during your race, you can pause by pressing the Options button, and then select “Free Camera.” You’re then free to move the game’s camera within a moderately-sized sphere around your racer, and take a screenshot using the Share button. As far as manual camera controls go, this photo mode is a bit on the light side. You can set a focus depth, and toggle between a handful of unlabeled color filters. You might be able to get some good shots out of this, and it is always a good thing to include, since players might share their creations on various social networks, which can spread word about the game. MXGP 3 – The Official Motocross Videogame is a game strictly for fans of professional motocross. There’s real challenge to be had with the game’s true-to-life physics, and varied weather and track conditions. But the game feels lacking in presentation. It needs something to inject some adrenaline into the career mode. Reading tweet-like messages from your agent gets old, fast. Still, for diehard motocross fans, this is your game. Review code for MXGP3: The Official Motocross Videogame provided by publisher. Reviewed on PS4 Pro. For more information on scoring, please read our Review Policy here.